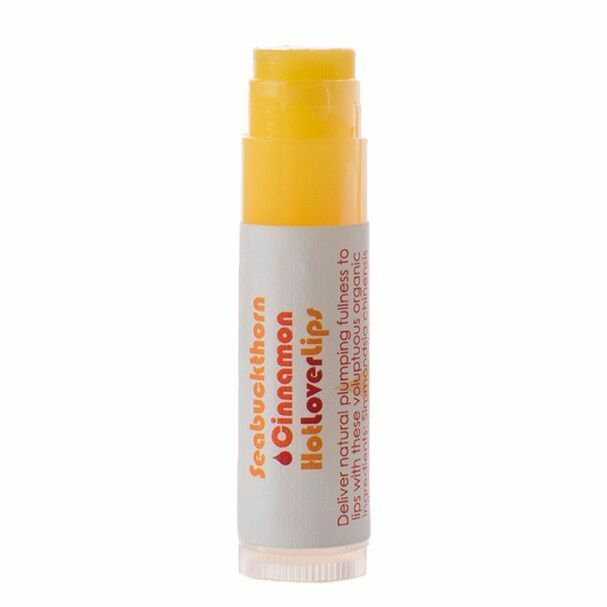 Cinnamon Seabuckthorn Hot Lover Lips delivers a natural plumping fullness by adding heat and tingle with the caress of voluptuous botanicals. Enjoy a full, radiant smile. 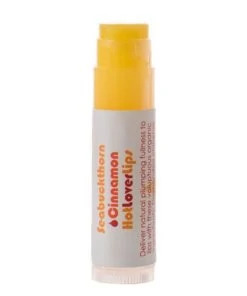 Cinnamon Seabuckthorn Hot Lover Lips naturally creates the look of full bodied lips, without harsh, drying chemicals. 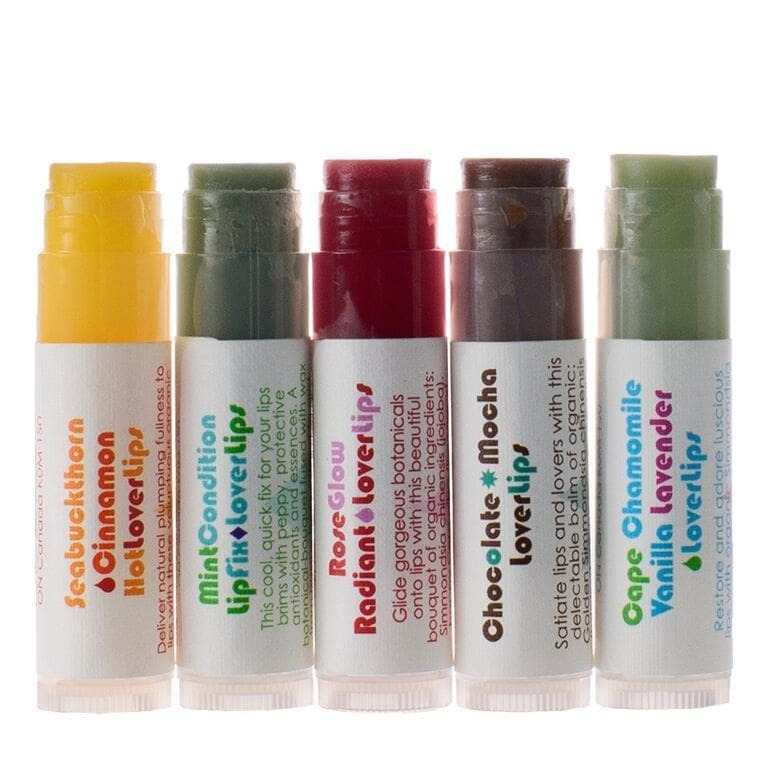 Our plant-powered formula enhances the natural color and shape of your lips by invigorating the skin with a spicy, tingly blend of cinnamon, cayenne, turmeric and ginger essential oils join golden jojoba and a dash of beeswax. The result? Full-bodied lips for a perfectly-plumped pout. Apply to lips to keep them lovely all day long. 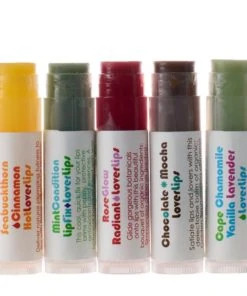 The balm is designed to make the lips feel warm, plump, and rosy. Patch test first to check for any sensitivity to cinnamon. Simmondsia chinensis (Jojoba), Cera alba (Beeswax), Hippophae rhamnoides (Seabuckthorn), Schisandra chinensis (Schizandra), Citrus sinensis (Blood Orange), Vanilla planifolia (Vanilla), Cinnamomum zeylanicum (Cinnamon), Zingiber officinale (Ginger), Curcuma longa (Turmeric), and Capsicum frutescens (Cayenne). Seabuckthorn (Hippophae rhamnoides) Supercritical Extract – Seabuckthorn sends its lipids into the skin, diminishing imbalances from the inside out. This supercritical extract is packed with omega fatty acids 3, 6, 7, and 9, vitamin, palmitoleic acids, carotenoids, and phytosterols. A single drop of seabuckthorn oil contains 190 different bioactive compounds. This bright orange essence is regenerative and complexion clearing – relaxing redness and paring puffiness. It helps to harmonize skin with sun. Schizandra Berry (Schisandra chinensis) Essential Oil – These bountiful berries have been used for thousands of years to boost the body’s chi. Known as “wu wei zi” in Chinese, this “five flavor fruit” contains a complex palette of flavors that are bitter, salty, spicy, sweet, and sour. Blood Orange (Citrus sinensis) Essential Oil – Living Libations Blood Orange Essential Oil is pure pleasantness for body and mind! Our Blood Orange Oil is organically harvested and steam distilled from the ripe fruit of the Italian Citrus sinensis. Sunny and sweet boosts the mood and the spirit with a smile. Skincare serums with this sunny treat, may feel regained firmness and elasticity. Vanilla (Vanilla planifolia) Essential Oil – Veritable vanilla moves beyond the ordinary in a distillation 200 times more potent than vanilla extract. As it lends a hint of mouth-watering sweetness, this infamous ingredient delights the senses with tantalizing honey notes. Cinnamon (Cinnamomum zeylanicum) Essential Oil – Spicy cinnamon oil warms its way onto lush lips. Ginger (Zingiber officinale) Essential Oil – Warm and zingy, it energizes the skin and assists with plumping and tinting the lips. Cayenne (Capsicum frutescens) Essential Oil – Our cayenne is a supercritical extract that is a tingly tonic. As a botanical biotic, it burns off bad breath bacteria.